Enjoying The Course: What is this Crazy Thing Called Forefoot Running? I'm about a month and a half into my 2018 goal of transitioning to forefoot running. After sharing my why on transitioning, I got a few questions about forefoot running. The answer seems very simple ⇝ It's when you run on the ball of your foot, right? It's more than just making initial contact with the ball of your foot. 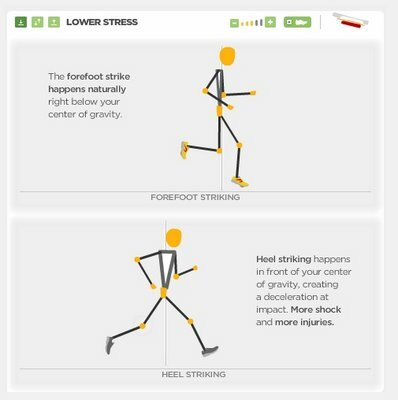 That's forefoot striking, but forefoot running is more than that. The forefoot strike is essential in forefoot running, but it doesn't mean that you run entirely on the front half of your foot. Instead, your heel should still kiss the ground after initial contact and before toeing off for your next step. Maybe not right away, but eventually, there is somewhat of a natural rolling of the foot when forefoot running. You'll land on the outside of the ball of your foot, rolling your foot to the inside and then kiss the heel all before gliding into that next step. The next thing to consider when talking about forefoot running is where your foot is actually landing compared to the rest of your body. How far is your strike from your center of gravity? Many runners overstride, or land far in front of their bodies. This may cause undue stress on your knees, hips, ankles. Pretty much anywhere you commonly hear about a running injury. Instead, you should strike under your knee and closer to your center mass (hips). This illustration helped me understand this the best. The text around the pictures isn't exactly accurate as neither image depicts the foot strike hitting the center of gravity, but the top picture is striking closer to the center line. I like this visual depiction of where the foot strikes in relation to the knee. I also really liked this depiction/description of good running form. It hits on so many things - keeping a straight back, not overextending your knees, driving from the hips and glutes, GLIDING, and lightly touching the heel down - while providing a good visual. Like I've already mentioned, it's more than just landing and running on your toes. I loved this description: “Forefoot” running doesn’t mean just landing on your forefoot, but focusing on having your balance there. Of course this starts with your hips and glutes. It's not just about your feet. Years of wearing shoes (not just for running, but all shoes) has reconditioned our bodies to be a bit imbalanced. Improving your balance will naturally help to improve your running form. I'll go more into this in a future post. 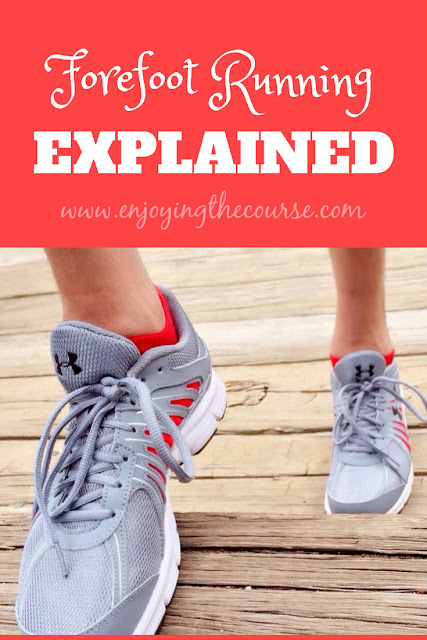 The common misconception is that forefoot running is just striking on your forefoot but that is oversimplifying it. It really is so much more than that! I went into this endeavor not really understanding what exactly it was and writing this post helped me a lot. The more I research and learn, the more I'm excited about this transition. I'm linking up today with Erika, Marcia and Patty for Tuesday's on the Run. Changing your running stride/style is so hard but you are doing so well with it! Those illustrations really do help slow what good form looks like. Do you have any cue words you use for yourself to keep your form on point? Thanks, Jennifer! I'm trying to be really smart about it. So far, no cue words. How's the transition going so far? Little tiny steps became my motto after I had a stress fracture...keeping the feet under you and not over extending is a great habit :) That is one thing that I have improved upon over the years. It makes a lot of sense when you think about it, right? I know nothing about this topic so thanks so much for the very informative blog post!